Newly acquired Oshawa General Allan McShane battles for the puck against former General and Kingston Frontenacs captain Stephen Desrocher during Oshawa’s 2-1 overtime victory on Jan. 15. 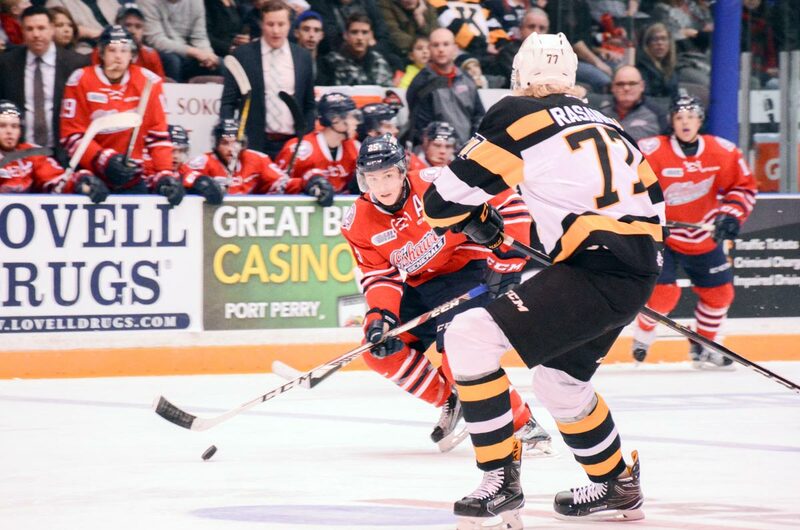 It took a bit of grit, but the Oshawa Generals were able to battle back late on Jan. 15 and top the visiting Kingston Frontenacs 2-1 in a shootout. For the 5,700 fans in attendance, the Oshawa Generals sure did make them wait to have something to cheer about. Both goalies were showcasing their talents as Jeremy Brodeur for the Gens and Mario Peccia for the Frontenacs stopped every shot they faced through the first two periods. It wasn’t until just past the seven-minute mark in the third that Kingston’s Jason Robertson was able to get the puck past Brodeur on the powerplay. However, the Tribute Communities Centre erupted with less than a minute to go when the, Gen’s latest acquisition Allan McShane tipped a shot from defencemen Alex Di Carlo and finally beat Peccia and send the game to overtime. When five minutes of 3-on-3 solved nothing, the game went to a shootout, and goals from Riley Stillman and Matt Brassard would seal the victory for Oshawa. For Brassard, skating to centre ice for the shootout was a bit nerve wracking as it happened to be his first ever shootout attempt. The nerves perhaps showed a little bit when Brassard, following his fake to backhand move, ended up in the net along with the puck. However, it was ruled a good goal as the puck was in the net prior to taking out Peccia in the process. Sunday’s victory is the third point in as many games for the Generals and the second time in that stretch that they forced overtime. On Jan. 12 in Peterborough, after going down 2-0 in the first period, the Gens battled to make it 3-2 in the second, then once again fell behind 4-3 in the final frame before tying it up late. However, in that instance, the Petes would come out with the victory. Oshawa would follow that up with a 5-1 loss to the Hamilton Bulldogs on Jan. 13. The Generals remain at the top of the Eastern Conference with a 24-13-3-2 record for 53 points, ahead of the second-place Petes (23-15-1-3) who currently sit with 50 points. Oshawa is back in action on Jan. 20 when they once again face off against the Frontenacs, this time at the K-Rock Centre. The Gens return home on Jan. 22 to face the Mississauga Steelheads.